The nation's hunters spend more time in pursuit of small game than on any other type of hunting. The sport's popularity stems from the relative ease of finding game. With a little scouting, you can probably locate small game within a few miles of your home. Even with a minimum of equipment, you can bring home a tasty meal. In this book, the term small game includes only the small mammals commonly hunted for sport and food, namely rabbit, hare, squirrel and raccoon. Even the novice has a reasonable chance to bag rabbits or squirrels. But this does not mean that small game hunting is easy. Your success will improve as your level of skill increases. And you can apply the skills you gain to other types of hunting. Small game hunters have ample opportunity to enjoy their sport. Most hunting seasons last at least six months, and some are continuous. Because you can find these animals close to home, you can make frequent short trips, which is difficult when hunting most other types of game. Almost all states and provinces have liberal bag limits. Most hunters use shotguns or .22 caliber rimfire rifles. But some prefer a combination gun with a .22 caliber rifle barrel on top and a 20 gauge shotgun barrel on the bottom. Combination guns are ideal for small game because you can fire one barrel at standing animals and the other at running targets. Hunters also use small-caliber centerfire rifles, muzzleloading rifles and shotguns, and bows with blunttipped arrows. A pair of waterproof leather boots is a good investment. With the possible exceptions of brush pants, a burr-proof jacket with a game pouch, binoculars, and a small knife for field dressing, you need little other equipment. Many hunters compare rabbit and squirrel meat to chicken. Raccoon tends to be oily and has a distinctive flavor of its own. Small game tastes better if you remove the entrails soon after killing the animal. Each year, hunters throughout the United States bag 30 to 40 million cottontail rabbits. This staggering total results from the cottontail's tremendous reproductive rate, and its ability to adapt to a wide range of habitats and foods. Cottontails breed in the spring and summer, producing up to eight litters, each with three to six young. They prefer brushy edges and woodlots, but can live almost anywhere with the exception of dense forests. They eat practically any type of green plant. When green vegetation dies back, they switch to twigs and bark. Rabbits start feeding before dawn and continue for two or three hours. They resume feeding at sunset. They move about most on calm, sunny days. Rain or wind drives them into heavy cover. A cottontail spends most of the day sitting in aform, a shallow depression in grass or snow. The grass eventually wears away, or the snow melts down and compacts. Often a form is concealed by overhanging grass or other type of overhead cover. Rabbits use their superb hearing to sense impending danger. To escape, they bolt away on established travel lanes. Cottontails run in an elusive, zig-zag pattern, but their speed is not as fast as many hunters believe. They normally run 12 to 15 miles-perhour, but can reach 20. Normally, cottontails will not run far. They spend their entire lives within a few acres, getting to know every feature of that area. Rather than run straight away, a rabbit will circle so it can stay in familiar territory. When frightened, it will often slip into a woodchuck burrow or brush pile. You can bag some cottontails by walking through likely cover, looking for rabbits in their forms. Upland bird hunters frequently flush rabbits by moving in typical walk-and-wait fashion. Like most game animals, a cottontail becomes nervous when a nearby hunter stands motionless, and will often bound from its resting spot. Hunting with dogs offers an interesting and effective alternative. Most hunters use slow-moving hounds, like beagles and bassets. When the dogs get close, the rabbit begins moving in a large circle and will eventually pass within shooting range of the hunter. Almost any dog will chase cottontails, but if it works too fast, the rabbit will dash under a brush pile or down a hole. Rabbits may contract a bacterial disease called tularemia, which causes them to behave listlessly and eventually kills them. But the disease is rare. One researcher found it in only 2 of 12,000 rabbits he examined. Nevertheless, refrain from shooting rabbits that move slowly or otherwise behave unusually. Tularemia can be transmitted to humans who eat or handle the flesh of infected animals. To hit zig-zagging cottontails, most hunters use shotguns with modified or improved cylinder chokes, and No. 6 shot. But when rabbits are in their forms or feeding in the open, a .22 rifle with a scope may enable you to get a shot before they spook. STRIP COVER, like brushy fencelines and hedgerows, makes ideal cottontail habitat. The brush and high grass provide food and cover. ABANDONED FARMS offer a variety of hiding spots. Look for rabbits around groves, under old machinery, or in tall grass or brush. BRUSH PILES provide good escape cover. A fox or owl would have little chance of reaching a rabbit beneath the logs and sticks. COTTONTAILS are named for their fluffy white tail. The fur on the upper part of the body is grayish-brown with black tips. The undersides are white. Adults measure 14-19 inches long and weigh 2-1/2 to 3-1/2 pounds. TRACKS of cottontails have side-by-side hind prints ahead of smaller front prints. One front foot falls ahead of the other. RUNWAYS in tall grass serve as escape routes. Rabbits usually follow the same paths through cover, eventually matting down the vegetation. FEEDING SIGNS include girdled shrubs or saplings, and cleanly-snipped twigs. Cottontails prefer the bark of sumac and fruit trees. RELEASE the dogs where you find plenty of sign. Beagles have excellent noses and will scour the ground thoroughly to find fresh scent. They will methodically follow the trail, slowly pushing the rabbit ahead. WAIT in the area where the dogs first detect fresh scent. A rabbit will usually circle and return to the spot where it was flushed. If it does not circle, try to predict its escape route, then attempt to intercept it. LOCATE a form with fresh sign. Droppings are round and about 3/8-inch across. A rabbit will seldom move far from its form. WALK around the form in ever-widening circles. 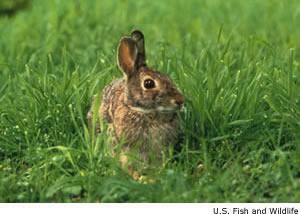 Look for the rabbit in clumps of brush, around the bases of trees, in tall grass, or in any dense cover. Continue walking until you cover the entire area within a 100-foot radius of the cottontail's form. Follow any fresh tracks you encounter. WATCH for rabbit tracks as you walk a strip of cover like a brushy fenceline. A retriever or flushing dog will scare up tight-holding rabbits. HUNT around abandoned farmsteads. Look for rabbits as you round the corner of a building and be ready for a quick shot. FLUSH cottontails by beating a brush pile with a stick. Or climb on top of the brush pile, jump up and down, and yell to scare out rabbits.